A week after our Crowne Plaza staycation, we went again for an exciting road trip to La Union. I have been wanting to visit Thunderbird Poro Point Resort for the longest time to experience the taste of Santorini life they offer. And finally, it came true. Time to tick off my bucket list! Thunderbird Poro Point is a resort and casino with a 65-hectare Mediterranean-inspired dream destination in North Luzon. It’s a 6-hour drive from Manila via North Luzon Expressway, Subic-Clark-Tarlac Expressway and Tarlac-Pangasinan-La Union Expressway. And since it’s a long drive, make sure the kids are loaded with toys and snacks to keep them entertained. Otherwise, they’ll end up grumpy the entire trip. We have reached our destination at around 2 pm, timely to check-in. The staff are friendly and welcomed us with a cold glass of lemonade. While checking in, others were enjoying an amazing view that overlooks the West Philippine Sea. It’s breathtaking! God is truly amazing with his works. Afterwards, we were assisted to our villa. Accommodations are in whitewashed buildings with cobalt blue accents inspired by the Santorini Islands in Greece. 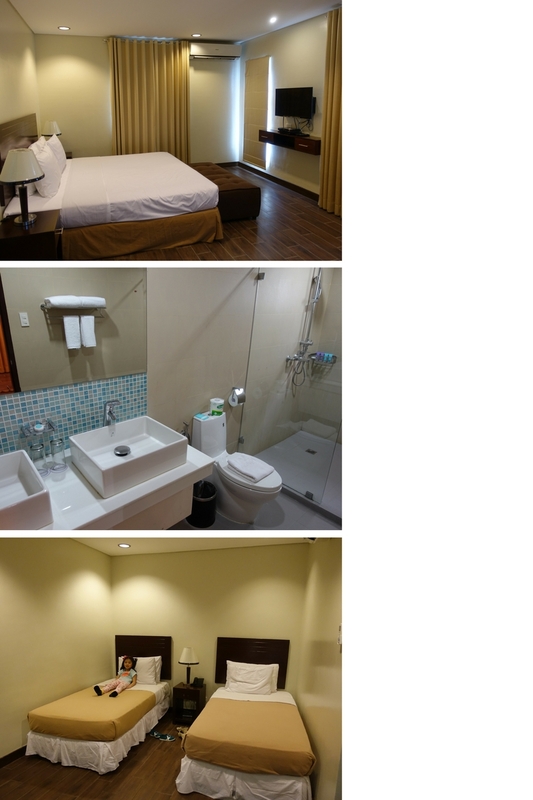 Each room has HD LED TV, a DVD player, pantry, electronic safety box, and Wi-Fi Internet access. Selected rooms have separate living and dining areas, and a furnished kitchenette. You can also choose one with a veranda facing the West Philippine Sea and view one of the most picturesque sunsets. We got 2 units of a fully furnished 2-bedroom villa for 12 adults and 4 kids. The place looks very neat and well-maintained. The first floor consists of a living area, dining area, and the kitchen. Glad to know cooking is allowed but make sure to bring your own utensils such as induction cooker, pans and etc. Villa has two rooms and each has its own bathroom and veranda. The place is really nice except for the broken air conditioning unit in the dining area while the other one was leaking at the master bedroom. Tried to call the hotel service but to no avail. The WiFi connection was pretty good, though. At 4 pm, we went out to check the resort, while some went swimming. Aside from the pool area, it was the beach club that I was super excited about. I wanted my little one to enjoy the beach like catching small waves and play with the fine sand. Honestly, I was a bit disappointed as I find it too small for a prestigious resort like Thunderbird. Nevertheless, my little one enjoyed his stay at the beach. It was such a priceless moment for the family. In addition to the pool area, beach club, and jogging path, Thunderbird Poro Point also has spa and massage services, a golf course, a Fiesta Casino, basketball court, indoor playground for kids and kids-at-heart. During our dinner time, we decided to try Olives Restaurant that serves Mediterranean cuisine. The food is tasty and delicious but I do hope they have more choices to try out. I find their menu so limited. The next morning, we had our buffet breakfast with many varieties such as bread, salads and all-time Filipino breakfast faves. I super love the danggit, tapa, and the fresh fruits served. While I find the rates a bit high, my family and I did still have a great Santorini life at Thunderbird. It is definitely worth every cent. Wow looks like you are enjoying your holiday. I love their infinity pool. Beautiful photos! I'd love to visit this. Hopefully this year! Thank you for sharing. I'm sure you had a great time. This is part of my bucket list, before pa yung movie ng No Other Woman, gusto ko na puntahan ito. I'm hesitant because it is expensive and it is too far so parang pagod kung overnight lang. I hope they will maintain the place, nakakadisappoint pag may sira sa room. This is such a lovely resort and it really does resemble Santorini! No need to go to Greece for it. such a nice place! would love to visit if i have chance!! Wah.. the scenery looks so good. What a perfect place to just chill at the pool with such a scenic view. A newly wed friend is spending her honeymoon here and most of her photos are truly breathtaking. She mentioned she's enjoying every moment. Looks like a nice place indeed to celebrate speciL occasions and milestones. I remember this place back in 2014 and some part of it are still under construction. I like the area where you can play golf near the creek. Quite dangerous but exciting, with exquisite beauty. Uy, ang ganda nga! Parang nasa ibang bansa lang ang peg! ♥ How much is costly kaya? haha. Baka hanggang pangarap nalang na makapunta kami dito. lol. Nice place! I'll add this in my bucket list! Nice. We are planning a trip to La Union and I am scouting resorts. This post is really helpful. Did you pay extra for the extra persons? 6 lang allowed sa villa di ba?